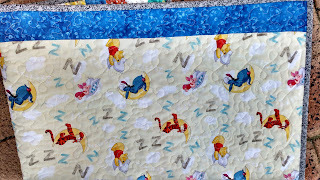 The novelty squares that were once in a panel are now surrounded by sashing, quilted and bound. Its quite bright, but since its for a second child, perhaps the slightly older one (around age 2) will enjoy it as well. Its always such a boon when I can use my stash as I did here. The panel was in a remnant bin for only $2 (AUD) and then in a second hand shop I found the backing sheet also for $2 (AUD). Its a simple stipple but with all that colour going on I think simple is best. 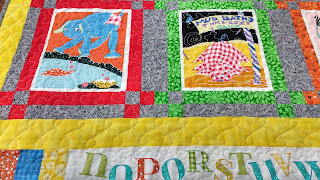 And then around the yellow border I just had to do a bit of a swirl. 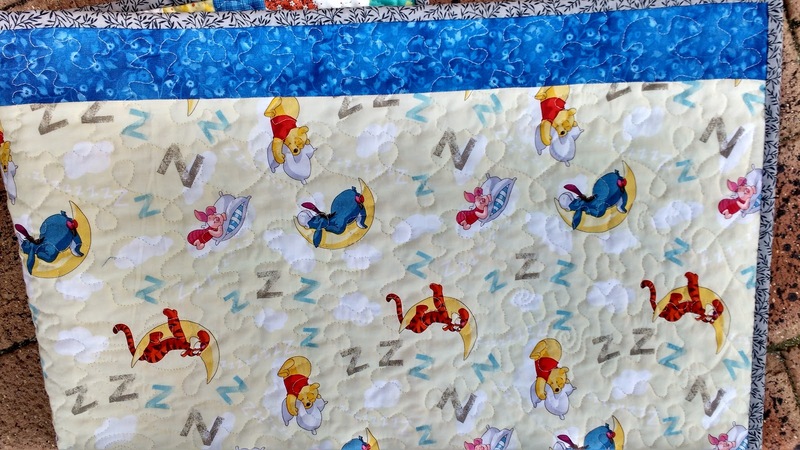 This is the backing - sweet for a new born, I really like Winnie the Pooh and Tigger! And it was just about the right size, just that two and half inch border needed at each end. This is the for grandchild of a friend. Nice to be able to make them for others since I don't have any grandchildren yet. Another simple make is this table runner for another friend who has her 65th birthday tomorrow. 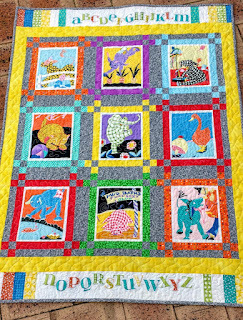 She has a cat and liked this fabric when I made a runner for my sister-in-law. 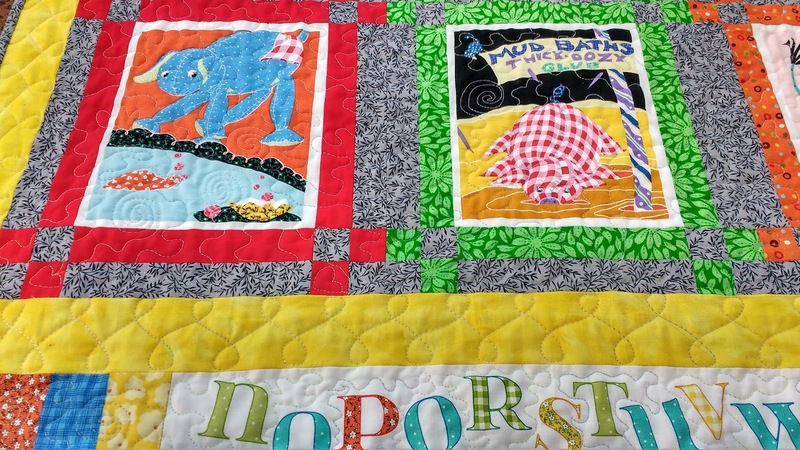 This is an easy frame of squares and the quilting also just echoing them. Sometimes simple is best. The border fabric adds a touch of class - makes it look almost Egyptian. Well on to the next project! What nice gifts, Lynn! 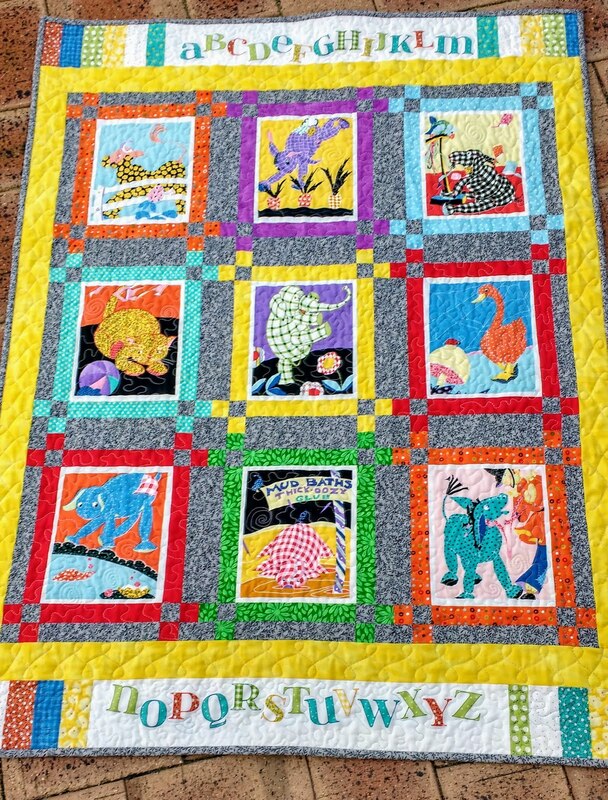 I love making bright baby quilts, too. Yours is so fun! I agree that a simple stipple is all it needed, and will keep it super soft for the baby. I love the cat table runner, too. Those soft browns will look so nice on a wooden table.